Divi is by far the most “elegant theme” out there. I used it recently to design and develop a clients website http://www.kaykayscakes.com. I did a lot of customization, so having some of the new features will be nice. Love Divi – for a relative novice like me it’s been a joy to work with. Have built my own site http://www.ideasonfood.co.uk and a successful event site at http://www.sherborneabbeyfestival.org – both of which have had so many compliments. Currently working on another – plus I’ve a number built on other Elegant Themes too. I’ve recently signed up as an affiliate – I have never recommended products on my site before but I can wholeheartedly recommend Elegant Themes! Well I have been migrating all my websites to Divi. Most of the time it only takes couple of hours to migrate them and it has been an awesome experience so far. My recent website I migrated to Divi is http://www.walks2remember.com . Now I am super excited about the Divi 2.0. Thanks Elegant Theme for such an awesome work. This is great new! This has been highly anticipated here at Vivid Clouds. Can’t wait for the new features. Thanks Elegant Themes. I have used Divi exactly once for a quick makeover for some friends with a farm: http://thecornucopiacsa.com. Divi has a lot of good qualities, but sensible CSS is not one of them. It wasn’t ready for forms or buttons, and the the menu and blocks/modules have an eccentric set of classes. Making significant style changes without a lot of !important; is not possible. Why not just use a complete and more conventional frontend framework? Cant wait for the release! My website http://www.jyotimaflak.com has never been better than with Divi. It gives me the clearness and creativity that I need. Thank you. I just started a web design business and I love Divi 1 so I guess I am gonna get crazy with 2. My first customers are more than satisfied with their sites. Check out http://www.kompazirenekonig.nl and http://yangyangcai.nl to sea the two complete different looks based on the same theme. Yep, you heard it well ! An ET WWDC, an Elegant Themes Wolrd Wide Divi Countdown ! Our printshop http://wydrukujemy.to based on Divi 1.x is almost ready. Expecting for 2.0 to improve portfolio and add more columns option to site. Using v1.0 here already http://Gabha.Photography and looking to switch http://photoinsomnia.com over to 2.0. 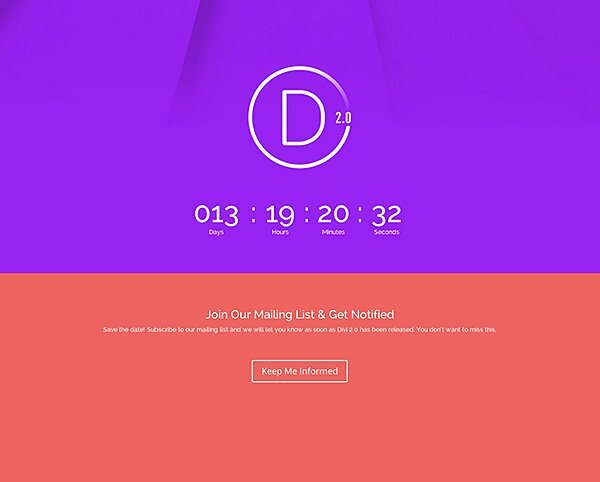 Divi 2.0 is here http://www.elegantthemes.com/demo/?theme=Divi !!!! Amazing! Thanks ET!